Masala Dosa is my favourite South Indian dish and specially the one prepared by my mother. We used to wait for our mother to prepare this dish. The thought about having masala dosa the next day used to make me awake the whole night. When I was a kid, I used to get up early morning before my mom would had finished all her side dishes for the dosa and used to irritate her saying I was hungry. Then in hurry my mother would serve that awesomely and heavenly tasted dosa. Thinking about it now, my mouth has started to water. So I am quickly moving to the recipe. Many people use the readymade dosa batter available in almost all the stores to prepare masala dosa. But I will be showing how to make a perfect masala dosa batter here. The Vegetable Kurma goes very well with masala dosa. Click on Vegetable Kurma to get it's recipe. 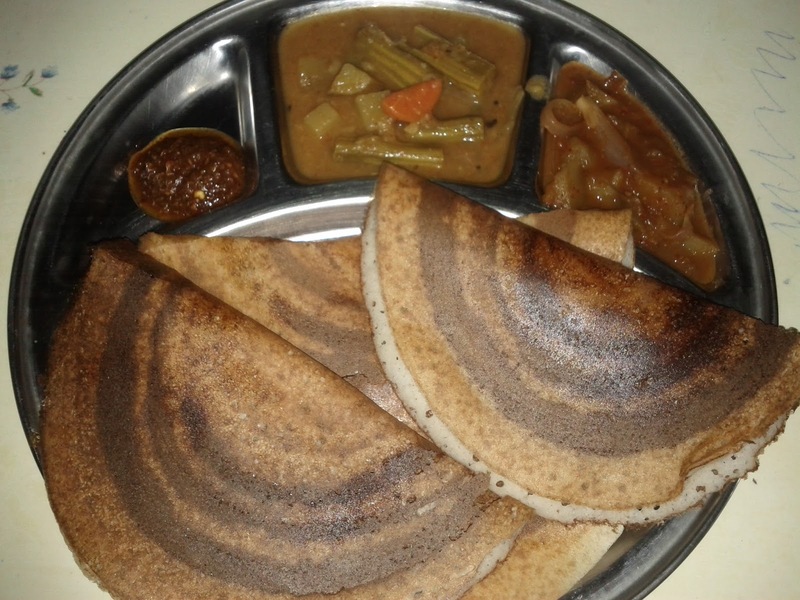 Sambar is another side dish for Masala Dosa. Click here, Sambar / Kolmbo for it's recipe. Use the soaking water while grinding for proper fermentation. Adding salt to the batter will fasten the process of fermentation. Mixing the batter with hands will also help for faster fermentation due to presence of bacteria in hand. Masala dosa is roasted only on one side. Can spread some spicy dry red chutney on top if needed. Wash normal white rice, toor dal and boiled/red rice for 3-4 times and soak them together in a bowl for 2 hours prior to grinding. Wash fenugreek seeds / methi seeds 2 times and soak them separately in a small bowl for 2 hours prior to grinding. In a grinder or a Mixer, add all the above ingredients along with sufficient amount of water. Grind until you get a fluffy and smooth consistency of the batter. Take the dosa batter in a large bowl and add salt. Now allow it to ferment overnight or for 7-8 hours. Next day or after 7-8 hours, you can see the batter fermented. 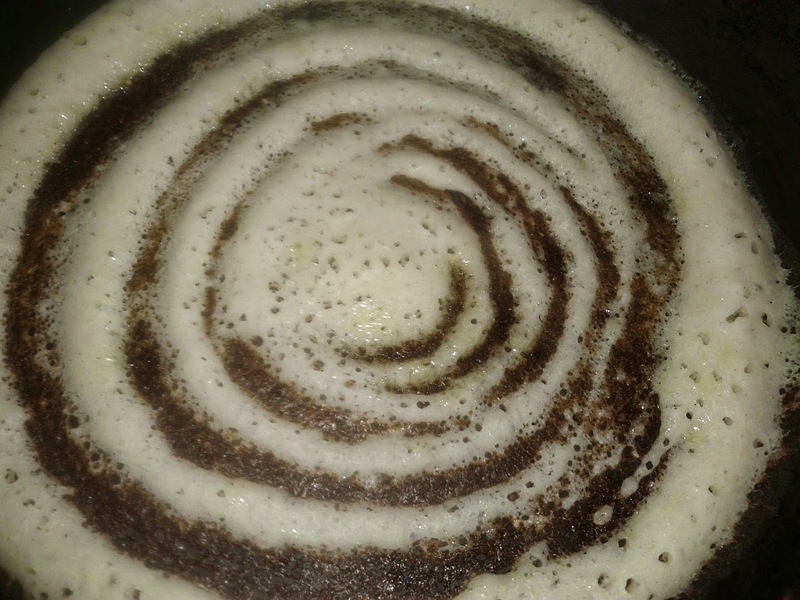 Before making the dosa, mix the batter very well for 3-4 times. Heat a non-stick pan/tava. Sprinkle some water to check if it is hot enogh and use a cloth to wipe the water on a pan. Repeat this every time before you pour the batter. Take a ladle full of batter, pour it on a non-stick tava or pan. Spread some oil on top and cook till one side is done on medium flame. Serve hot with chutney, sambar, potato/batata bhajji or vegetable kurma.